You’re on your way to becoming an early childhood education teacher, and you’re ready to get your teaching license and become certified. Part of the license/certification process includes taking the Praxis II Early Childhood Education Exam. The exam assesses knowledge of specific subject matter, as well general and subject-specific teaching skills, for professionals who teach grades K-12. Below, you’ll find information about the examination, as well as tools to help you study for and pass the test. The exam has a designation number of 5025. Note that each state sets its own certification and passing score requirements, so it’s important to check the specifics with your local agency. What is the fee for taking the test, and how long do candidates have to complete the test? The test costs $120, and there is a two-hour test time. All tests are delivered by computer. What categories will be covered on the Praxis II Early Childhood Education (5025) Exam? There are five content areas on the test. What should I bring to the test center on test day? Please bring a copy of your test admission ticket. You’ll also need an acceptable, unexpired form of identification (like a driver’s license, passport, or military ID) that includes your photo and a signature. The name on your identification and admission ticket must exactly match. Any candidate who fails to meet these requirements will not be allowed to take the test. Also, please make sure you arrive at the test center at least 30 minutes before your examination time. Any candidate who arrives late runs the risk of being denied admission to take the test and losing all test fees. No. In general, all electronic and personal items are prohibited. Personal items include back packs, pencils, pens, handbags and the like. When will I know if I passed the test? It depends. Some unofficial test scores are available as soon as the test is complete; other scores take as many as 16 business days and are available online. 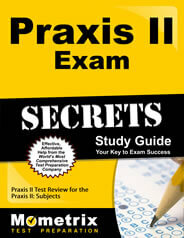 How do I prepare for the Praxis II Early Childhood Education (5025) Exam? That’s where Mometrix comes in. 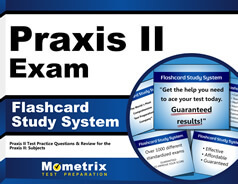 We have an amazing suite of products designed to help you navigate the Praxis II Early Childhood Education Exam. Our study guide includes practice test questions, problem solving tips, and insights into test-taking techniques. Our portable, flash card study system helps you study on the go. With these tools in hand, you’ll be well prepared to take the test.